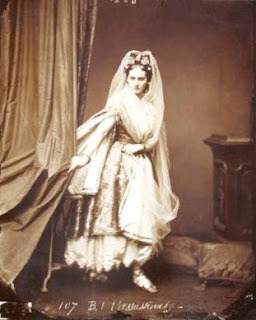 One of a series from 1863-66, taken when she was was not yet 30. Have you seen this photograph? Its arresting image has been grabbing imaginations since its first public viewing at the dawn of the 20th century. It was loved by the Surrealists and has continued to captivate, surfacing throughout the 20th and into the 21st century as an iconic image from the early days of photography. At the opening of the 21th century, a book was published about the woman behind the frame, Virginia Oldoini, Countess Castiglioni. La Divine Comtesse was created by Pierre Apraxine and Xavier Demange (curators of the Gilman Paper Collection that was absorbed by the Metropolitan Museum in NYC) in 2000. I found it on my bookshelf a few weeks ago and couldn’t resist peering at the remarkable images again –– they draw you in. 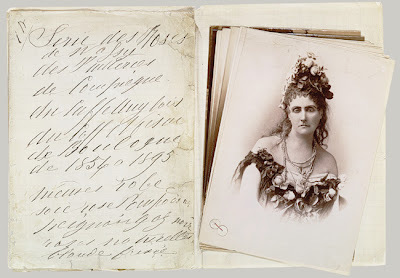 He bought many photographs and other personal items from her estate after she died, and created a shrine for her in his Palais Rose in Paris. The newer book tells the story of the image-obsessed Countess and includes many of the finest specimens of her self-obsession from the 400 photographs she had taken of herself over 40 years. She’s been called everything from an insane narcissist to the original Cindy Sherman. The truth is, Virginia was an original and in many ways a metaphor for the lost grandeur and beauty of the 2nd Empire that was not to be regained, no matter how much one wished for it to be so. She was also a tragic figure who could not accept the cruel truth that she had grown old and lost her greatest treasure –– her beauty. 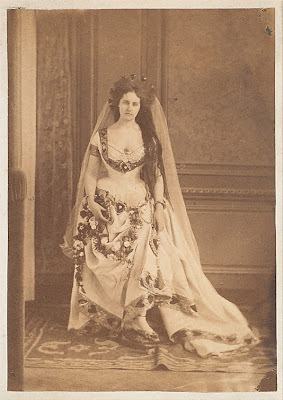 Countess Castiglione lived from 1837 to 1899, but her star flared for only a few short years of the 2nd Empire –– during the reign of her one-time lover, Napoleon III. sent us by Italy, Madame the Countess de Castiglione. fancy-dress ball at the Ministry of Foreign Affairs. the most fantastic and daring costume imaginable. 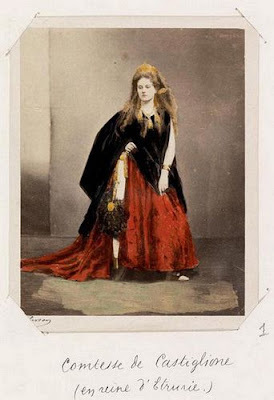 She virtually disappeared from the world after she convinced Otto von Bismark not to pillage Paris in 1871 (she had been involved in political intrigue for many years, perhaps taking lovers to advance various causes at the request of her ‘handlers’). 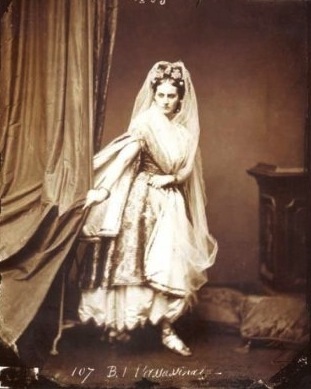 She had lost her shine much earlier and was considered passé by 1863 when she wore the costume of a Queen of Ertruria for another grand fancy-dress ball. 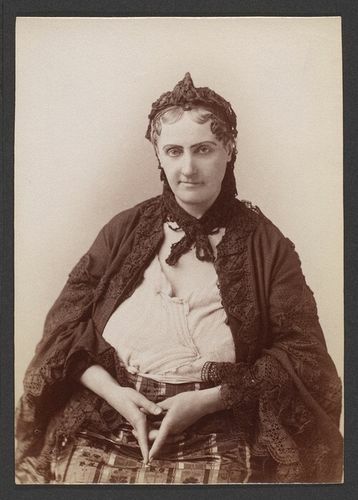 Her performance was lauded by the press but ridiculed by her detractors (most notably, the Empress and former fan, Princess Mernich). 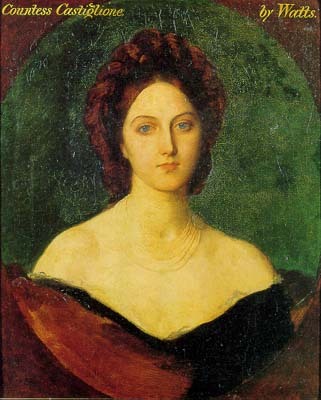 After many travels and much moving between Italy and France with decreased circumstances (she had run through 2 million francs of her husband’s money before he died in 1867, wiping out his family fortune on top of more millions from ‘admirers’), she entombed herself in black, mirror-less rooms on the Place Vêndome in 1878, only venturing at night, veiled, to walk her precious dogs when lighting was more kind. She came out again in the 1890’s to have more photographs taken by Pierson –– photographs of the ruin she had become –– a lonely, toothless, probably mad alchoholic wearing 30 year-old clothes. However, for a bright moment she was considered the most beautiful woman in the world. And in the mind of many, she was a symbol of the beauty of a lost radiant world. Thing is, the 2nd Empire was considered a golden time by Proust and many of his fin de siècle pals, especially Robert de Montesquiou. Most of them came of age just after it ended with a crash in 1870. In a way, that world ended with the Siege of Paris, not unlike the way the culture of the anti-bellum American South evaporated with the Civil War –– many felt the wrenching loss of a way of life that had seemed gracious, fine and full of glorious, hoop-skirted excess. 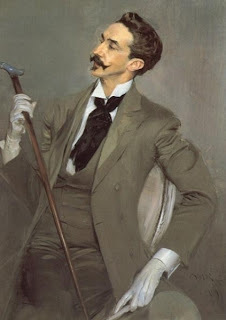 Proust often referred to that life before the Siege of Paris in 1870 with enormous longing –– the beautiful Portuguese word, saudade, says it best –– " a vague and constant desire for something that does not and probably cannot exist ... a turning towards the past or towards the future." I have often wondered if Proust's obsession with food (which he thought about more that he ate) came from the want of those times when rich and poor had nothing to eat (there is a famous menu from one of Paris' finest restaurants that featured dog and rat). Stories of golden meals at places like Maison Dorée and Café Anglais must have replaced some hunger pains with dreams of better times. Very few places were more golden than La Maison Dorée. 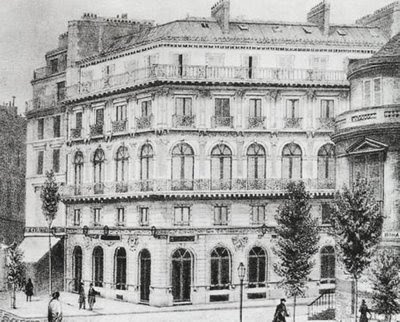 Originally called “Restaurant of the Cité”, its gilded balconies and luxurious interiors soon had the public to referring to it as Maison Dorée and the name stuck. Wikipedia said that the restaurant had different entrances for different classes of patrons. The entrance on rue Lafitte was for the best patrons, the boulevard entrance for the well-heeled masses. The rue Lafitte entrance led to the infamous private rooms or ‘cabinets’ where rich and famous men entertained their lady friends ‘privately’. 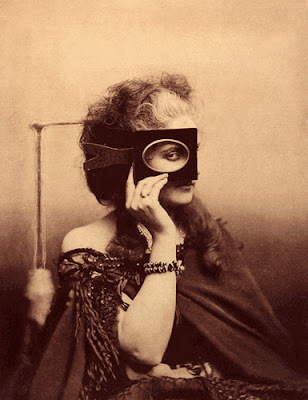 Maison Dorée saw the very best of society and the arts. Proust staged an important scene from Remembrance of Things Past there. Everyone from Edward VII to Balzac and Alexander Dumas (who had the offices of his newspaper, Le Mousquetaire, in the building) were regular patrons. The neighborhood hummed with creative energy, lubricated by the monied class and the fabulous food of the restaurant. "Mr. Casimir was primarily an artist, he left nothing to chance. Only the finest food entered his kitchen. He triumphed in the art of preparing fish (including carp in red wine) and, by popular demand, his handwritten recipes have been around the world without ever having been executed. The braised dishes, under his hand, attained a succulence that won admiration. His chops a la Soubise, his loins of veal, its fricandeaux, plats de côte, its tails and beef skirts, his stews, its fat melted in the mouth like candy. His stews developed an aroma that enveloped the house and neighborhood. As gourmets wanted to be warned of the presence of certain dishes on the menu of the day!" One has only to look to the great Alexandre Dumas (pere), of 3 Musketeers fame, and his Le Grand Dictionnaire de Cuisine (available in its 1200 page entirety online HERE if you read French) to see what was eaten in the golden time of the boulevardiers, grissettes and lorettes (the women of money or beauty who chased life and love for money or for fun – often kept by gentlemen of means) who frequented Maison Dorée. Alexandre Dumas (fils)’ 1848 La Dame aux Camellias captured the grissettes and lorettes beautifully – both the bright flame of their youth and beauty and the wrenching misery of their later lives past their prime when they were heartlessly discarded like an out-of-fashion frock. Our Countess was surely a casualty of this cold reality –– the madness that descended upon her may have shielded her from knowing it. Alexandre Dumas Dictionary of Cuisine was a labor of love that was published after his death. It is an amazing work that talks about food in a creative, joyful way. The man loved to eat well and it shows. Fortunate for me, it also contains menus from that golden age of Parisian dining in the 2nd Empire. The menu that follows comes from a meal at Maison Dorée that he had shared with friends one Spring… could be anywhere from the 1840s to 60s. That is not clear. What is clear is that is it a brilliant offering of food that would delight any gourmand today. Menu d'un dîner, 15 Avril. Ris de veau petits pois. Clos Saint-Robert Poncet Deville et Champagne Saint-Marceaux. In considering what to make with so many glorious choices, I went for something familiar…Poulet sauté bordelaise –– chicken bordelaise. Bordelaise is just one of those sauces that defines old haute cuisine and with reason, it is terribly good (and not that hard to make!). A little investigation showed me that bordelaise was not always the dark, red-wined version we know today. It seems when the wine sauce was used with chicken or fish it was made with white wine. In Escoffier’s Ma Cuisine the recipe is slightly different: “6 T wine (white or red), 1 t chopped shallot, pinch of course pepper. 2 T demi-glace sauce, a little tomato sauce, 1 ½ oz beef marrow. You reduce the wine to half with the shallot and pepper then add demi-glace and tomato. Boil and strain. Add beef marrow cut into rings and poached in meat stock…” but then, this is a sauce for beef. I read an early version of the sauce was made with sauterne in The Royal Cookery Book (Le livre de cuisine) by Jules Gouffe from 1869. It used “2 gills of sauterne reduced to half with 1 pinch pepper and 1 T of shallots (blanched and chopped) as well as 1 pint of Espagnole sauce (a butter and flour thickened meat sauce), reduced for 5 minutes to which is added 1 T chopped parsley”. I combined a bit of all of them for my recipe and added a few mushrooms to the mix. Let me just say, this stuff is awesome. It makes anything it touches taste madly delicious –– the potatoes and artichokes are perfect for the dish. I am looking forward to doing the whole menu one of these days to give my friends a taste of that golden age. Something tells me they will be thrilled. We won’t forget to toast the Countess, wherever she may be. My toast?? I hope she has had her beauty restored and is posing happily in the Empyrean. Sauté the chicken breasts (after seasoning them with salt and pepper) in 2 T butter and remove when nearly done. Reserve, covered. Sauté the chopped shallot in the remaining butter. Add the mushrooms and sauté. Remove the mushrooms to the plate with the chicken and cover. Add the white wine and sauterne and reduce by at least half till it thickens. Add the demi-glace and warm. Add salt and pepper to taste. *Heat the butter and oil for the potato cake. Place slices around the skillet in 2 circles or ovals and season. Sauté on one side until brown and then gently flip the potatoes and brown the other side (this will take about as long as making the chicken). ** Sauté the onion slices slowly until translucent and slightly browned. Warm the chicken and mushrooms in a separate pan. You can strain the sauce if you wish and re-heat. Place the chicken on the potato cakes with steamed artichoke hearts, asparagus and fried onions. Sprinkle with mushrooms and spoon the sauce over the chicken. Sprinkle with parsley. I would guess the idiom "The bigger they are, the harder they fall" holds true here! Don't you just wonder what it would be like to hold a conversation with her! What a grand rise and amazing fall from grace and interesting read! No fall from grace as far as the Chicken Bordelaise, though. Although I'll probably not be using morel mushrooms, it sounds like a delicious dish. Ooo! What an interesting read on Countess Castiflione. I love the first photo you posted. What a fabulous phote! beautiful photos. i like all the photos you have posted over here . Thanks for such snaps. Fascinating, Deana. And I loved this quote: “She seemed so full of her triumphant beauty, she was so preoccupied by it that after a few moments… she began to get on your nerves. Not a movement, not a gesture was unstudied.” No wonder her star didn't last...other women would have put an end to that. A magnificent plate filled with luscious food! This is an epic story! Oh those beautiful dresses that she wore! How magnificent! What a time to be a socialite. The chicken Bordelaise looks so elegant against the beautiful sunny plate. Your historical articles are just mesmerizing here! And the photos are equally eery in the sense that we so often see vintage photos of people in grand costumes (my grandparents especially), but when you learn more about these people and what they did, I could just stare into their gaze for hours and examine and only WONDER how they saw the world. What a beautiful woman indeed, and the magnificent artifacts of Paris at this time. CAFÉ ANGLAIS....I remember this from Babette's Feast, which I know you are so familiar with. You are amazing. Your comment on my post was so eloquently written and is dear to me. Our mother's indeed allowed us to be who we are, not knowing the full impact of their character in the shaping of our womanhood. Oh, if only my mother knew how much I turned out just like her. 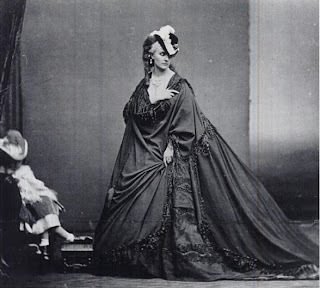 What a fascinating photo, the first one, and very interesting to learn about Countess Castiflione. The chicken bordelaise sounds fantastic! Looks delicious but I am always amazed by the wonderful serving pieces you have. What an entrancing story! And such mesmerizing photos, her dresses were beyond beautiful! Thank you for sharing this recipe and of course, the story. I made a simpler version with just the chicken, morels (they are in season in Michigan!) and roasted some potatoes with thyme. The sauce was amazing and I'm glad I made enough for leftovers! Your posts are always so interesting and unique Deana. The dish sounds lovely. P.S. I adore your china!